ACRE Policy Analyst Mavuto Kalulu recently praised two new steps toward transparency for Arkansas’s county governments: Faulkner County Circuit Clerk Crystal Taylor’s [no relation] work on transparency, and legislative efforts to require counties to publish their budgets online. In an article published in the Log Cabin Democrat on March 6th entitled “Circuit clerk launches Open Checkbook,” Kalulu praises a new feature implemented by Faulkner County Circuit Clerk Crystal Taylor on her office’s website that provides a monthly update on how taxpayer dollars are being spent. Taylor attended the Transparency Workshop hosted by ACRE on November 9th, 2017. The workshop allowed ACRE researchers and public officials to collaborate on best practices to improve transparency at the state and local levels. You can visit the “Open Checkbook” section of the county website here. Kalulu also spoke in favor of statewide transparency initiatives before the Arkansas House City, County and Local Affairs Committee on March 7. Kalulu spoke to legislators about the benefits of transparency to taxpayers and government officials during a debate over House Bill 1343, sponsored by Rep. Spencer Hawks. The legislation would require all Arkansas counties to post their annual budget on a website owned or maintained by the county, the state, or the Association of Arkansas Counties. Counties are already required to publish such information in their local newspaper. Only 8 of Arkansas’s 75 counties had their budgets available when ACRE researchers checked in 2017 and 2018 for our Access Arkansas: County-Level Web Transparency report. House Bill 1343 passed out of the House Committee unanimously and passed the full House of Representatives with no dissenting votes on March 7th. You can watch discussion from both days here. (Kalulu’s testimony begins at 10:14:50 a.m. in video of the March 6th committee meeting).The legislation also sailed through the Senate City, County and Local Affairs Committee on March 14th. You can watch their discussion of the legislation here. The bill was amended in the Senate committee to give counties until the beginning of 2020 to begin compliance with the legislation if it becomes law. The bill passed the Senate on March 19th unanimously. Interested in more of our work on transparency? 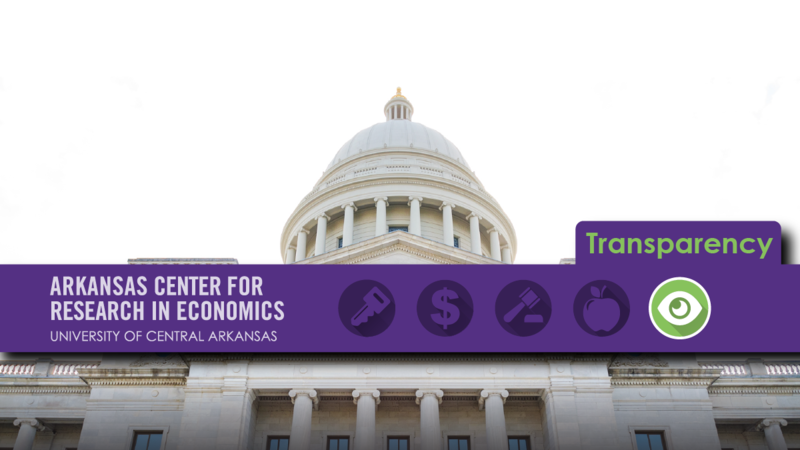 Check out ACRE’s new policy brief, “Let the Sun Shine In: Improving Access to Arkansas Counties’ Financial Information,” which shows what an average Arkansan would experience when attempting to collect county financial information. More ACRE research on this issue can be found on our Transparency page.